Did you know that YaHuWaH left 100 witnesses to testify of his set apart name? The 3 English letters "YHW" or in Hebrew the 3 letters are "יהו", is the short name for the creator YaHuWaH. EVERYTIME those 3 HEBREW letters "יהו", or "YHW" are together, its ALWAYS pronounced "YaHuW". Using the pure original Paleo Hebrew vowel sounds, (NOT Aramaic or Greek) this IS the proper pronunciation of these 3 letters "יהו" (in Hebrew those letters are called the Yod, Hey and Waw). 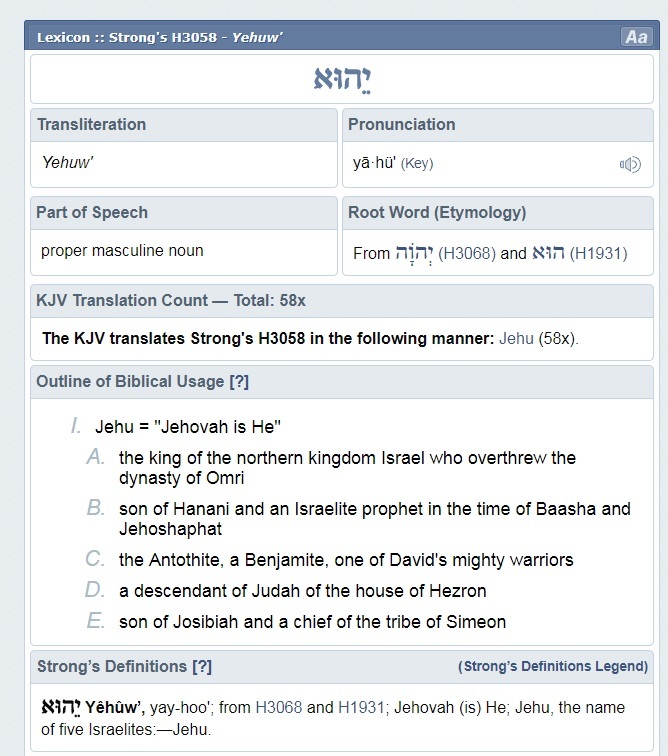 The letters "YHW" or "YaHuW" (like Yahoo) IS the heavenly fathers short name for "YHWH" YaHuWaH (Ya-hoo-wah) and the Strong's concordance backs this up 100 times in its data! As we have explained many times, NOT only is THE LETTER "J" the last addition to the English alphabet, but the letter "J" (which WAS a "Y" in Hebrew text) and "V" (which WAS a "W" or "WaW" in Hebrew text) DID NOT exists in the original Paleo Hebrew/Phoenician alphabet. In Hebrew, they wrote words without vowels, hence ALL words were written with consonants only. The vowels sounds were always pronounced, but they just didn't write them in their words, also in Hebrew words were originally written from right to left, ex: יהוה = HWHY or HaWuHaY. In Hebrew when it comes to names, the majority of them had an original long form (which held history, meaning lineage and power), but unfortunately over time those names have been changed, modernized and shorted down (which removes its history, meaning, lineage and power). YaHuW means "YaHuWaH is He or He is YaHuWaH"
Each of the 100 words or names (being a witness to YaHuWaH's TRUE NAME) can ALL be broken down and tracked back to their ABaRY (Hebrew) roots. When you do this, you will find the Creators short name YHW (YaHuW) in each name or word. Lets use the English name "Matthew" for example. In the Strong's Concordance its G3156 (G meaning its a Greek word) and it says the meaning of the name "Matthew" is "gift of JeHoVaH"
His name is NOT "MatathJeHoV"
Meaning: "gift or reward of YaHuWaH"